Production: Crown Film Unit, with the co-operation of the Home Office, Ministry of Home Security, and National Fire Service; black and white, 35mm; running time: 63 minutes, some sources state 60 minutes. Released 1943. Filmed in London. Producer: Ian Dalrymple; screenplay: Humphrey Jennings; photography: C. Pennington-Richards; editor: Stewart McAllister; sound recordists: Ken Cameron and Jock May; production designer: Edward Carrick; music: William Alwyn; musical direction: Muir Mathieson. Cast: Officer George Gravett ( Sub-Officer Dykes ); Lt. Fireman Philip Dickson ( Fireman Walters ); Lt. Fireman Fred Griffiths ( Johnny Daniels ); Lt. Fireman Loris Rey ( J. Rumbold ); Fireman Johnny Houghton ( S. H. Jackson ); Fireman T. P. Smith ( B. A. Brown ); Fireman John Barker ( J. Vallance ); Fireman W. Sansom ( Barrett ); Asst. Group Officer Green ( Mrs Townsend ); Firewoman Betty Martin ( Betty ); Firewoman Eileen White ( Eileen ). Grierson, John, Humphrey Jennings: A Tribute , London, 1951. Hardy, Forsyth, Grierson on Documentary , revised edition, Lon-don, 1966. Lovell, Alan, and Jim Hillier, Studies in Documentary , New York, 1972. Hodkinson, Anthony, and Rodney Sheratsky, Humphrey Jennings: More Than a Maker of Films , Hanover, 1982. Jennings, Mary-Lou, editor, Humphrey Jennings: Film-Maker/Painter/ Poet , London, 1982. Vaughan, Dai, Portrait of an Invisible Man: The Working Life of Stewart McAllister, Film Editor , London, 1983. Aldgate, Anthony, and Jeffrey Richards, Britain Can Take It: The British Cinema in the Second World War , Oxford, 1986. Ellis, Jack C., The Documentary Idea , Englewood Cliffs, 1989. Jennings, Humphrey, The Humphrey Jennings Film Reader , New York, 1995. Wright, Basil, "Humphrey Jennings," in Sight and Sound (London), December 1950. Lambert, Gavin, "Jennings' Britain," in Sight and Sound (London), May 1951. Vedres, Nicole, "Humphrey Jennings—A Memoir," in Sight and Sound (London), May 1951. Mekas, Jonas, "Index to the Creative Work of Humphrey Jennings," in Film Forum (Mesdetten), 8 July 1954. Dand, Charles, "Britain's Screen Poet," in Films in Review (New York), February 1955. Strick, Philip, in Films and Filming (London), May 1961. "Jennings Issue," of Film Quarterly (London), Winter 1961–62. Millar, Gavin, in Sight and Sound (London), Spring 1969. Belmans, Jacques, "Humphrey Jennings, 1907–1950," in Anthologie du Cinéma 6 , Paris, 1971. Bitomsky, H., "Uber Humphrey Jennings und einige seiner Filme," in Filmkritik (Munich), November 1975. Sharatsky, R. E., "Humphrey Jennings: Artist of the British Documentary," in Film Library Quarterly (New York), vol. 8, no. 3–4, 1975. Anderson, Lindsay, "Only Connect: Some Aspects of the Work of Humphrey Jennings," in Non-Fiction Film Theory and Criticism , edited by Richard Barsam, New York, 1976. Barrot, O., in Cinéma d'Aujourd'hui (Paris), February-March 1977. Colls, R., and P. Dodd, "Representing the Nation: British Documentary Film 1930–45," in Screen (London), January-February 1985. Nowell-Smith, Geoffrey, "Humphrey Jennings: Surrealist Observer," in All Our Yesterdays , edited by Charles Barr, London, 1986. Britton, A., "Their Finest Hour: Humphrey Jennings and the British Imperial Myth of World War II," in CineAction (Toronto), Fall 1989. Stewart, S., and Lester D. Friedman, "An Interview with Lindsay Anderson," in Film Criticism (Meadville), vol. 16, no. 1–2, Fall-Winter 1991–92. Thomson, D., "A Sight for Sore Eyes," in Film Comment (New York), no. 29, March/April 1993. Williams, D., "Humphrey Jennings: a Sense of Conciousness," in Metro Magazine (St. Kilda West), no. 103, 1995. 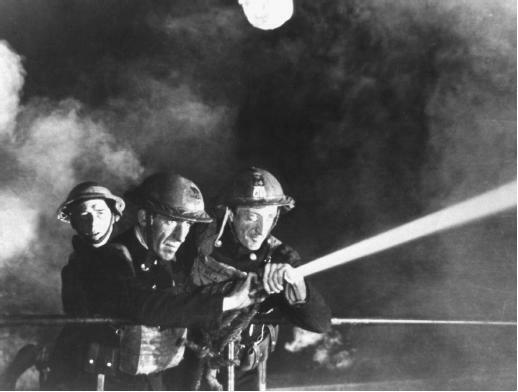 Fires Were Started was one of the semi-documentary features produced in Britain during World War II by both the government Crown Film Unit and the commercial studios following the success of such prototypes as Target for Tonight (1941) and In Which We Serve (1942). This film combined the actuality of documentary (a recreated or composite and representative event portrayed by people who had actually been involved in such an event) with the narrative line and dramatic heighting of fiction. Fires Were Started is about the work of the Auxiliary Fire Service during the dreadful German fire-bomb raids on London. It follows a new recruit through a 24-hour shift with one unit. During the day the men train and perform menial chores. Following dinner they briefly relax and their camaraderie and understated humor become fully evident. As the raid begins, they proceed to their perilous and exhausting work, on this occasion putting out a fire raging near a munitions ship docked along the Thames. Though one of their number falls from a burning building to his death, the fire is finally extinguished. The film ends with the burial of the dead fireman intercut with the munitions ship moving out to sea. As was usual with the British wartime films, the emphasis is given to the togetherness of the British people (with the cast a cross-section of classes). The propaganda function of this particular film seems to have been to show the quality and courage of the brave men and women who were working to insure that Britain would withstand the enemy assault. The enemy remains offscreen, and none of the hatred is portrayed which might have seemed an appropriate response to the bombing; instead, the destruction is treated almost as if it were a natural disaster. By using the device of the new recruit, Jennings can let us see and learn not only about the functioning of this fire-fighting service but also about the diverse and likable personalities it brings together. When the raid begins, we are able to follow, without aid of commentary, the tactics of the fire-fighters through their actions and conversations; the phone calls from headquarters; the maps with pins stuck in them; the chalked lists of equipment. Among other things, Fires Were Started is a model of teaching without didacticism. But where its true greatness lies is in the way it simultaneously informs, persuades, and moves us. In this film Jennings goes beyond other of the semi-documentaries in differentiating and developing the characters of his non-actor firemen. Besides being very skillful at narrative, Jennings was a visual-aural poet who captured the precise image for a feeling, which also contained symbolic reverberations of English tradition and wartime exigencies—a poet who offered the exact words men might have spoken and even the songs they might have sung in the circumstances. The mood of this film may have well matched the mood of its wartime audience. It has lasted as a supplement to the national memory of what wartime England felt like.